Did you see us this weekend at the Port Orange Family Days Spring Food Festival event?! We had a lot of fun talking with folks and telling those interested about the local Party! Ann, Sara, Joe and Gabe! 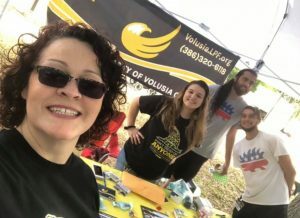 Thank you to all the Volusia Libertarians that came out this weekend and volunteered: Kyle, Joe, Ann, Lea, Jonathan, Josh, Gabe and Sara! 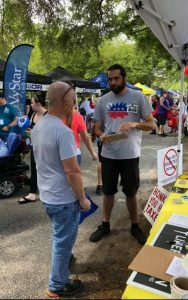 Gabe and Josh greeting interested folks and telling them about the Libertarian Party of Volusia County! 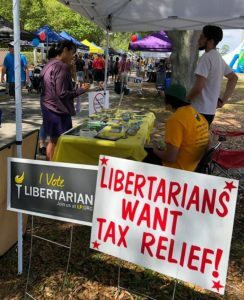 Do you know that the Libertarian Party of Volusia County is recommending a NO vote on the proposed 1/2 % Sales Tax Increase mail-in ballot special election? Vote NO May 21st! Joe discussing some of the questions on the World’s Smallest Political Quiz! Most people scored pretty well on the World’s Smallest Political Quiz! Another great one is ISideWith.com. Tell us where you score!